We haven’t blogged much recently as we’ve been busy launching a new, not-for-profit company, The Eco Travel Network Ltd which grew out of our b-bug project which The Prospectory ran last year. The aim of the Eco Travel Network (ETN) is to enable visitors and residents of the Brecon Beacons National Park to travel around in lightweight, low energy vehicles – powered by electricity generated by local solar, hydro and wind. With the support of the Sustainable Development Fund and Renault UK, the ETN has purchased a fleet of 7 Renault Twizys which it is leasing to accommodation providers in the National Park for them to use themselves and rent to their visiting guests to replace journeys they would otherwise make by car. Now, the scheme is launched, we are starting to refocus on The Prospectory’s original research interests in the ETN project. From a Prospectory perspective, the most interesting thing about the Twizy is that it’s not trying to be a car. It offers something different– a small, lightweight, open-sided, low energy runabout. We think the Twizy’s “not-car-ness” might give it a better chance than other electric vehicles of disrupting the existing car market. Why? Because conventional electric vehicles are having to compete with petrol and diesel cars on speed, comfort, range and all the well-established values of the existing car market which auto journalists use to evaluate new offerings and customers expect when they buy a car. That is difficult for electric vehicles to achieve at the moment and impossible in the same price bracket. Established technologies tend to be disrupted and eventually replaced by new technologies which, at their outset don’t perform as well along existing dimensions of value but offer customers new and different values. Digital cameras are an example. The first digital cameras were heavy, more expensive and delivered much poorer image quality but people found they could do different things with them. Digital cameras have now caught up on image quality and price and almost completely replaced traditional film but they have also radically changed the way we do photography. The Twizy makes a statement that it is NOT a “proper car” – it is open-sided, unheated, tandem-seated and ridiculous for travelling long distances in but, at the same time, it’s nippy, cheap, handy and fun for the 85% of journeys which are under 5 miles. So, from a research perspective, we are interested to gather feedback from our Twizy users to see if people do think about the Twizy differently, travel differently with it and whether it helps disrupt the established dimensions of the car market. Or do people think it’s an under-specified car and start to demand it has doors, windows, heaters, more comfortable seating and a greater speed and range. We have noticed that auto-journalists are the first to view it that way and, sadly, the industry is already offering Twizy windows as an accessory. The jury is out. We could attempt to educate people that they don’t need a car with a performance spec (speed, power, comfort, range) to take them 400 miles to Scotland simply to nip 2 miles down the road to buy some milk or drop the kids at school – especially when most of the energy is taken up moving the car rather than the people in it. However, along with the neuroscientists, we believe that people’s attitudes (in this case to car travel) follow their behaviour, rather than the reverse. So, our goal is to give people a chance to experience doing short journeys in a different kind of vehicle which clearly doesn’t have the performance characteristics necessary to take them to Scotland but which, as a result, uses a fraction of the energy to transport them 2 miles down the road. We will then explore how that experience (however brief) impacts their thinking and attitudes to car travel. We originally focussed our experiments on tourists because people on holiday are away from their normal context, time constraints and habitual behaviours and they tend to be more open to doing things differently. But will these experiments work? 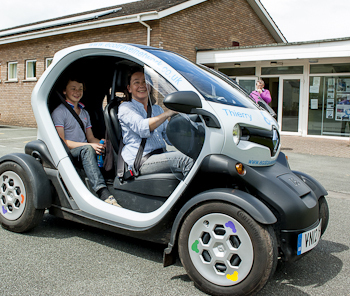 We don’t know but we are confident that we and the Twizy drivers will have a lot of fun finding out. Watch this space. This entry was posted in Psychology, Technology and tagged attitudes, behaviour, eco travel network, prospectory, psychology, Renault Twizy. Bookmark the permalink. 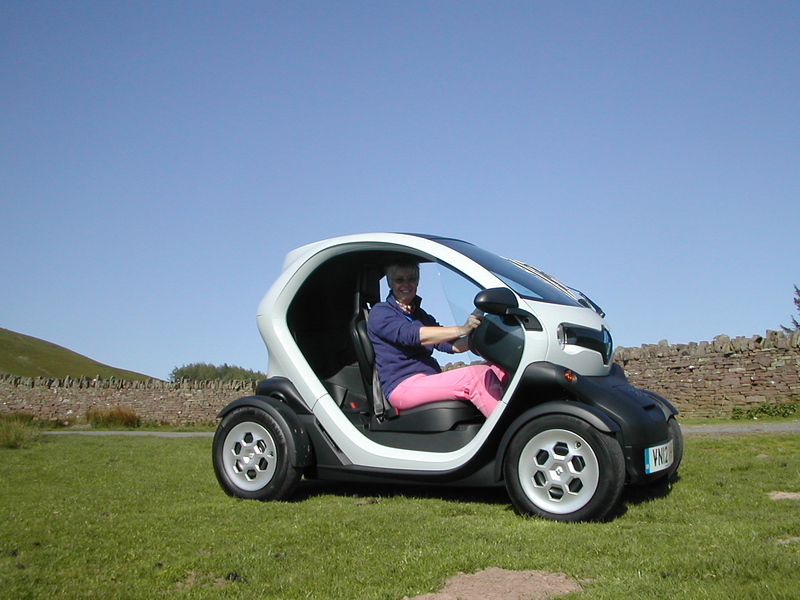 Renault Twizy car is one of the popular Bermuda rental cars on the Island. This electric car is highly recommended to tour around the whole island.